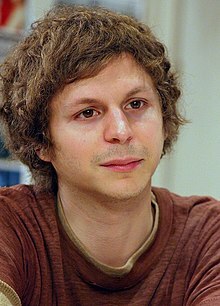 مایکل سرا (اینگیلیسجه: Michael Cera) کانادالی موسیقی‌چی و اوْیونچو. ۷ ژوئن ۱۹۸۸ ‏ ایلینده دۆنیایا گؤز آچیب. "|| 2012, 2015 || Comedy Bang! Bang! || Himself || 2 episodes	"
1999 Twice in a Lifetime Skateboarder #2 Episode: "The Blame Game"
1999 Noddy Butch Episode: "Big Bullies"
2000 La Femme Nikita Jerome Episode: "He Came from Four"
2001 George Shrinks Cadwell Boy Episode: "Speed Shrinks"
2000 Anne of Green Gables: The Animated Series Benjamin Episode: "The Best Partner"
2005 Wayside Todd (voice) Episode: "Pilot"
2006 Veronica Mars Dean Rudolph Episode: "The Rapes of Graff"
2006 Tom Goes to the Mayor Scrotch (voice) Episode: "Undercover"
2007 Tim and Eric Awesome Show, Great Job! Jamie Stevens Episode: "Cats"
2012 The Simpsons Nick (voice) Episode: "The Daughter Also Rises"
2014 Saturday Night Live Surrogate Episode: "Jonah Hill/Bastille"
2015 Louie Young Man Episode: "Sleepover"
2017 Twin Peaks Wally Brando Episode: "Part 4"
2018 The Shivering Truth Delmer (voice) Episode: "Chaos Beknownst"
2019 Weird City Tawny Episode: "A Family"
اینگیلیسجه ویکی‌پدیاسی‌نین ایشلدنلری طرفیندن یارانمیش«Michael Cera»، مقاله‌سیندن گؤتورولوبدور. ( ۲۲ ژانویه ۲۰۱۸ تاریخینده یوْخلانیلیبدیر). قارداش پروژه‌لرده مایکل سرا گؤره داها آرتیق بیلگی‌لر تاپابیلرسینیز. بۇ صفحه‌‌ سوْن دفعه ‏۱۳ مارس ۲۰۱۹، ‏۱۳:۰۳ تاریخینده دَییشدیریلمیشدیر.